Nobuaki Nakata is a one of the foremost emerging young talents from Japan. He was born in Kyoto, Japan to a mother who is a famous Japanese classical dancer. At age of 13, Nakata started learning the double bass and later went on to study both conducting and double bass in the Toho Gakuen School of Music. At the same time as his music training he also studied medical science in the University of Tsukuba. In 2005, Nakata moved to Vienna to study early music in the Conservatory of Vienna. And in 2007 he made his European debut by conducting “Carmina Burana” at the State Opera Stara Zagora, Bulgaria. Nakata was awarded the 1st prize at the Danube Symphony Orchestra’s International Conducting Competition in Budapest and has since been working regularly with DSO. Nakata has conducted concerts throughout the world including the premier of Mahler’s 2nd Symphony in the Tochigi prefecture (Japan), a very successful tour in Estonia with the Latvian National Symphony Orchestra as well as appearances with the Stage of Japan National Cultural Festival and Opera Brasov (Rumania). A high point of his career was his 2008 concert in Rio de Janeiro for the 100th anniversary of Japanese immigration to Brazil with His Imperial Highness the Crown Prince of Japan in attendance. In 2014 he performed “Ein Heldenleben” in Yamanashi with Her Imperial Highness the Princess Takamado in attendance as well as take part in concert tours with Tokyo City Philharmonic Orchestra. In the field of contemporary music, Nakata has worked with many young composers like Andirs Dzenitis (Latvia) and Gabriel Penido (Brazil) who have given high praise to his performances of their works. 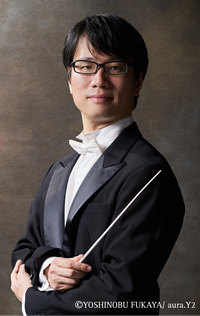 He has performed recently with numerous orchestras, chamber orchestras and choirs such as Porto Alegre Symphony Orchestra, Petrobras Symphony Orchestra, Tokyo City Philharmonic Orchestra, Kobe City Chamber Orchestra, Gumma Symphony Orchestra, Kyusyu Symphony Orchestra, Tokyo Akademische Kapelle, Shin-Yu-Kai Choir, Tokyo Oratorio Society, Musicariva Festival Orchestra, I Maestri, Yamanashi Symphony Orchestra. Nakata has been Chief Conductor and founder of the Melos Philharmonic Orchestra since 1995 and the Gumma Baroque Orchestra since 2014. He was also formerly Principal Guest Conductor of the State Opera Stara Zagora from 2008 until 2010. Besides his activities as a conductor Nakata was also the principal double bassist of the New Japan Plharmonic and the co-principal double bassist of the Opera Valencia “Palau de les Arts” under maestro Lorin Maazel. Additionally, Nakata has played in many period instrument ensembles in Europe. Copyright Nobuaki Nakata 2019 All Rights Reserved.